A multi-corrective regime to balance skin and fight against stress & environment. 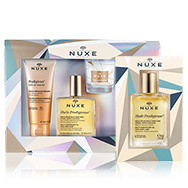 NUXE Gift Sets are luxury collections that includes NUXE's best-selling must-haves. Discover the NUXE fragrances here. NUXE's Huile Prodigieuse products, are beauty industry's Holy Grail of skin illuminators. This line is 98.8% natural and combines 30% Precious Plant Oils with Vitamin E to nourish, repair and soften your face, body and hair in a single step. The range's dry oils have a super-activated formula which leaves your face and body feeling smooth and soft, whilst your hair is brought to life with shine, bounce and volume. A fine concoction of borage, St John's wort, hazelnut, sweet almond, macadamia and camellia leaves this beautiful-smelling range a firm beauty favourite worldwide, and all products are suitable for all skin types, hair types and ages. NUXE Cleansers gently cleanse all skin types - Including sensitive! Removing your skin of impurities and dirt that can build-up during the day and cause irritation, dryness and sensitivity as well as nasty breakouts. From the luxurious Eau Démaquillante Micellaire (Micellar cleansing water) to the gorgeous Gelée Exfoliante Douce (gentle aromatic gel), and Masque Purifiant Doux (clarifying cream-mask), this beautiful, fragrant and 100% natural range from NUXE is bound to have the right cleanser for your skin. Treat yourself to the luxurious feel of NUXE cleansers and enjoy your skin's increased brightness and radiance. 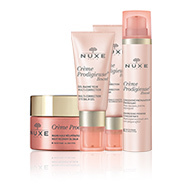 NUXE Anti-Ageing ranges plump and firm fine lines and wrinkles for a youthful, radiant result! NUXE's Moisturisers combat against signs of ageing for a hydrated, plumped complexion. Hydrate and condition eyes and lips for a youthful, nourished result. Perfect and protect your complexion with NUXE's DD Creams! NUXE's Rêve de Miel range has been especially designed for those with dry and sensitive skin. Using the brand's innovative technology and natural formulas to bring you the créme-de-la-créme of skincare. The specialist products in the Rêve de Miel line replenish lipids, soothe and calm the skin, whilst providing ultra nourishment for all dry and sensitive skin types. 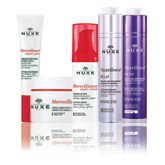 The NUXE Body range has been designed for all skin types, textures and for women of all ages. A 100% effective and pleasurable range of products, NUXE Body is a complete body care routine with delightful textures and delicious fragrances. All of the gorgeous fondant products combine pleasure, effectiveness and naturality for a body that is beautiful by Nature. Providing UVA and UVB protection whilst banishing signs of ageing and photoageing. Suitable for particularly delicate skins, it is absorbed easily and leaves the skin soft, supple and velvety. Photostable, free of alcohol, non-comedogenic and paraben-free. NUXE Men is a skincare range specifically formulated to moisturise, balance and protect men's skin. The soothing formulas are enriched with 6 Tree extracts and 79% natural origin ingredients. The products are suitable for all skin types - even sensitive, and maintain skin's natural strength and balance moisture levels. 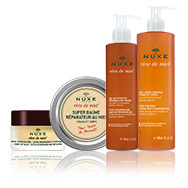 View all NUXE skin care products in one place. Not sure what you are looking for? Simply select your skin requirement and product type. “Fascinated by the unquantifiable power of plants, and convinced that the plant kingdom is the place to start when seeking out major new treatments, I focused on 5 fundamentals [nature, innovation, evaluation, accessibility and sensory experience] that, day after day, inspire my beauty philosophy and provide my focus for building the NUXE brand” – Aliza Jabès, Nuxe Founder. Aliza Jabès, as a young female entrepreneur, discovered NUXE in the early 1990’s, a small formulation laboratory in Paris. Deciding to build from there a beauty brand which would encapsulated her belief in powerful natural ingredients along with the innovation from a pharmaceutical approach… and a little luxury for good measure! The NUXE Laboratory is committed to prioritising ingredients with a natural origin and to selecting active ingredients from the plant kingdom. 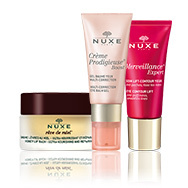 NUXE face products are all non-comedogenic (using them does not cause blemishes). To prove the safety and effectiveness of NUXE products, all our formulas are subjected to tests carried out under dermatological supervision by external laboratories approved by the Ministry of Research. NUXE is at the forefront of cosmetic science. Thanks to the integrated Research and Development Lab at NUXE, they have now filed over 45 patents for their pioneering use of plants and the proven results that they achieve. In 2007 and 2011, Aliza Jabès and NUXE received industry awards bestowed on companies that make innovation their driving force... indisputable professional recognition of the NUXE Group's business model. 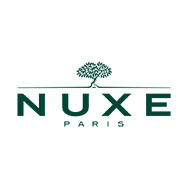 It isn’t just industry insiders that have fallen in love with NUXE, with over 168 consumer awards under their belts, over 5,000 points of sale in France alone and distributed in nearly 60 countries, NUXE’s popularity continues to rise, with their sumptuous textures, delightful aromas and truly effective skincare. The hero product that has become a must have for many beauty fans is Nuxe Huile Prodigieuse. A truly remarkable dry oil that in 2017 will celebrate its 25th Anniversary with an updated formulation to include even more nourishing oils. Huile Prodigieuse is a multi-use product to use all year round to nourish and protect your face, body and even your hair. With a winning combination of precious oils, Vitamin E, Tsubaki oil, Sweet Almond, Camellia oil, Borage, Hazelnut, Macadamia and Argan. All obtained by cold pressing to produce the highest quality, and enhanced with Orange Blossom, Magnolia and Vanilla to create the now iconic fragrance of Nuxe Huile Prodigieuse. At the heart of NUXE's philosophy is respect for nature and their eco-attitude, striving to promote sustainability, and minimising their environmental impact through rigorous product formulations and improved packaging. Nuxe supports a number of environmental charities, one notably for bee conservation in the Vosges Mountains in eastern France. Nuxe sponsors hives, aiming to create new colonies that will thrive in this environment and increase the bee population. Honey is a key ingredient in the bestselling Rêve de Miel® range – delightfully translated as” Honey Dream”, this ultra nourishing range is perfect for soothing dry skin. The creamy, long lasting texture of the NUXE Rêve de Miel Lip Balm along with the subtle taste of grapefruit is truly delicious and a perfect introduction to the brand if you are new to NUXE!